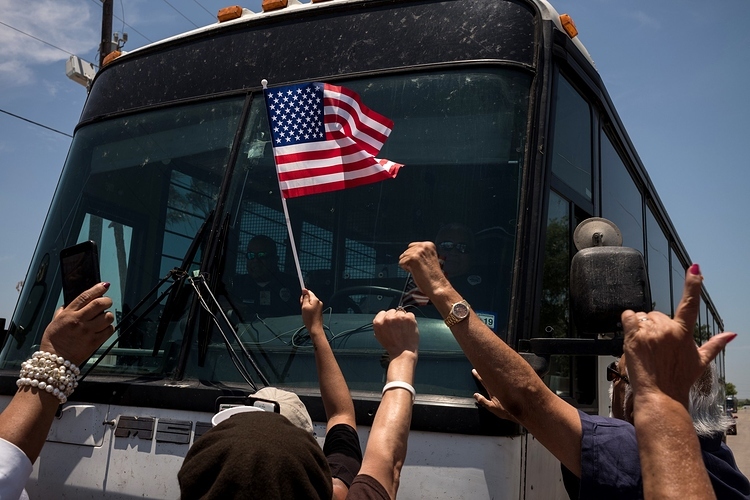 Masha Gessen: "How to Resist Validating Trump's View of Sanctuary Cities"
At the New Yorker website, Masha Gessen examines the dubious press coverage of Donald Trump’s threat last week to transport immigrant detainees to US sanctuary cities. These cities—including New York, San Francisco, New Orleans, and many others—have pledged not to cooperate with federal government efforts to track down and detain undocumented immigrants. As Gessen shows, most press coverage of Trump’s proposal, which is seen as punishment for this noncooperation, has failed to question why the mere presence of immigrants in these cities would constitute a danger. This failure unwittingly supports Trump’s framing of immigrants as inherently harmful to the communities they enter. Check out an excerpt from Gessen’s piece below. An unnamed D.H.S. official told the Washington Post that these ideas were “retaliation, to show them, ‘Your lack of cooperation has impacts.’” The available reporting doesn’t tell us exactly why Trump may have viewed these moves as retaliatory. He may assume that more immigrants means more trouble, of the chaotic, criminal variety that he so often conjures. Or, even more cynically, he may assume that any influx of newcomers will stress communities, producing tensions that make life worse for elected officials whom he dislikes. Whatever Trump thinks he wants, the problem for journalists is in finding a way to talk about it that doesn’t validate the President’s assumptions. As often happens with Trump and his policies, this is more difficult than it ought to be. The Post’s story notes that the move would have “targeted” House Speaker Nancy Pelosi, among others. Never does the story question, or suggest, what the mechanism of the imagined “retaliation” would have been—how, exactly, the immigrants would have been expected to create trouble. That subtly affirms the assumption that trouble would have been caused. But the story, like so many Trump-era stories, is a trap: questioning the assumption would have led journalists down the slippery slope of arguing about facts, denying outrageous claims that shouldn’t be given the time it takes to deny them. Image: Demonstrators surround a bus carrying asylum seekers in McAllen, Texas. Via the New Yorker.